Hi all, Ron here…..yes, yesterday I turned 57! I had a fine birthday dinner with my old amigo Mike Perini, at the Zingerman’s Roadhouse. Any and all Ambioids who get up here to Ann Arbor…we’ll go and have a great time. What was birthday dinner you ask? Andouille sausage Mac ‘N Cheese….luxurious cheddar cheese with Z’s house made red-hot (spicy hot) sausage….it was sublime. Plus a side of their fantastic mashed potatoes. And of course aided and abetted by two Old Fashioneds. one with Rye, one with Bourbon…for taste testing! You do get a free desert on your birthday, and I chose the raspberry white chiffon cake…. Sorry I haven’t been around much…things are looking poorly for me at the moment, and soon I will have no where to live. (long story) But I haven’t quit, and am trying to make things better. My OT, Jodie, has been my strongest support of late. She is convinced that this will be my year. Me…I wonder. Also the Noble Karen from this watering hole, has been both a support…and a delight. She channels the power of Cow Luck, through the phone to me. There are many disadvantages to getting older….but one of the many advantages is that you know more who you are and what has meaning to you. I’m surprising happy with me, despite a life of one damn disaster after another. This is not a trivial thing. For example I recently found out my younger (of two) sisters died at age 65…and she died in December 2012! No one told me, and I wasn’t even in the obit. 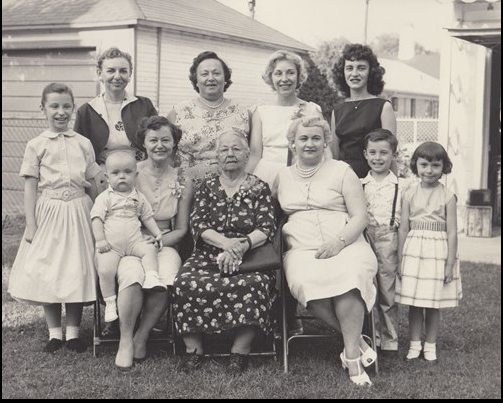 I went the website of the funeral home she was in, and found 15 family pics…that I have never seen… I enclose one taken in 1960 with Baby Ron looking like Bismarck sitting on Mom’s knee…the late sister is on the far left, Diane. Grandma is in the middle. This led to a very ugly confrontation with the older sister…but it was good for me to get all that anger out, and I’m now done with scant family I thought I had. It’s funny to say, but my online friends, many of whom I’ve never met, including Amba, mean much more to me than many of my “real world” acquaintances. Thank you all for just being there and being yourselves. I’m a better person for that. Let’s add some ketchup to this year and make it better than the last…well, too many!